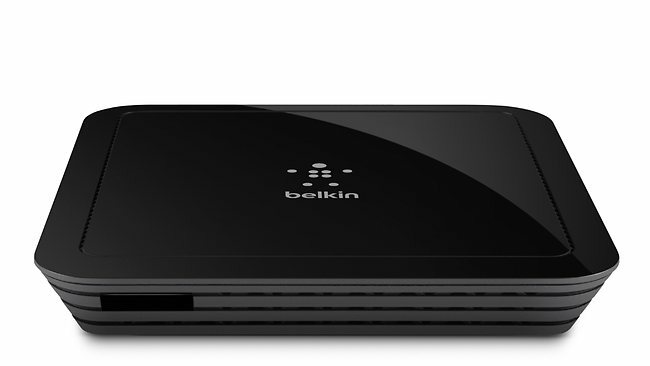 THE Belkin @TV sounds like what dreams are made of, at least the dreams of TV-loving couch potatoes. It connects to your set-top box and lets you watch what's on your TV through your computer, smartphone or iPad. The theory is you're sitting at the bus stop or your office, and need to see your favourite TV show right away. So, you whip out your tablet, navigate a virtual remote as at home and your wish is answered. It lives up to the theory, although the images on your tablet or computer are not in HD and can pause, or lose sound quality, depending on your wi-fi connection. The @TV looks like the offspring you might get if a router mated with a frozen dinner box and the set up is a little surprising. When almost every gadget seems to have a HDMI connector, you might wonder why you have to plug in component and RCA cables with this. Nevertheless, it's easy enough to connect your set-top box (a Foxtel IQ unit in our case) with the @TV by following the cables' colour coding. Given it says wi-fi on the box, we boldly ignored the instructions and it turned out we were right. Download the software on the computer, and it takes you through the prompts of requiring wi-fi network details and brand and model of your set-top box. You have to download an app to your iPad if you want to watch @TV through it, but given it's a free iPad app that's not a problem. However, the iPhone app is $12.99 so you might think twice before watching shows through @TV on your phone. One great feature is that you can record a show on your iPad as it's playing on TV. Tape a few late-night movies on to your iPad and you'll have something to do on your next long plane flight.